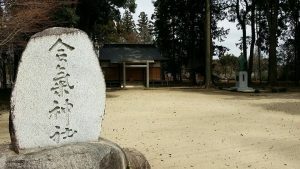 Intellectual aikido is aikido that is practiced without understanding principles hidden in form of the technique. 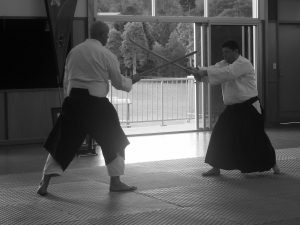 It is aikido that seeks to mimic the aikido techniques of others without understanding the basic principles that underlie the technique. Defining movement and sounding like you know what you are doing vs really understanding the essence of the art. 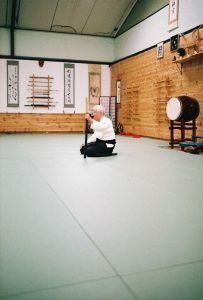 Aikido form starts at the basic level – the sole of the foot connected to the (mother) earth and the connection through the body to energy of heaven. The central axis of the body becomes the conduit of that energy. The energy originates at the sole of the foot, is driven by the legs and amplified by the hara. It is then directed by the mind to the kensen which is the movement of the technique. The integrity of the structure and the connection needs to be maintained in dynamic movement. If the integrity is lost the aikido is lost. This often occurs when the practitioner thinks about the way the movement should look rather than concentrating on the basic form of the technique. In other words tries to intellectualise the technique. Watching the techniques of the masters of aikido will not allow mastery of the technique through osmosis. Seeking the basic principles underlying the techniques and adopting those basics will contribute toward learning a technique. When it doesn’t work, it’s not time to change technique, but time to change principle. Doing something stupid over and over again only makes it something stupid done well. When doing technique we should feel the earth/heaven connection. Our basic sword cutting principles and good body structure should be natural body movement from the internalisation of corrected repeated practice. This is known as unconscious competence – after a lot of practice of a skill so it becomes “second nature” and can be performed easily. The skill can be performed while executing another task. There is little if any intellect involved. The intuitive body takes over. Where the mind attaches the mind goes. To allow the body to “take over” we must stop any intellectual process. We must have “no mind”. You cannot intellectualise any budo where the highest value is the absence of intellect. (mushin) The great men of old were great because they followed this training method. The spirit does not grow through the intellect, but through detachment from it. Become less attached to titles and fancy talking and more attached to the essence of training the spirit. If aikido becomes easy it loses its spiritual value. It’s through the difficulty that one discovers the true self. It’s through overcoming and constant self reflection we grow. Intellectualising spirituality is absurd. No great spiritual master claims to have advanced the self through the intellect, but rather through detachment from it. Again the question needs to be asked what it is people hope to get from their art? If it’s the founders Aikido, then the path is Tanren, and training is Misogi Harai. This is well documented by those that trained with and understood the masters wishes. The path back to the true teaching must start in the heart. Masakatsu agatsu, victory Over the ego, over the intellect, over preconceived ideology is the first step. This is Tanren, tempering the spirit through the body, breaking the intellect. Misogi Harai is brushing away the dust that dulls the mirror of the soul, this is ukemi. Once this is understood, one can achieve Katsu Hayahi, speed that transcends space and time. Mushin, the path beyond intellectual thought. The study of true budo is at a dire time. What came of the ancient ways is about to get lost to the progress of human intellect. Many say a shift is needed for what we study to remain relevant to this modern world. I would say we need to walk in the opposite direction to discover what created great men of renown of the past. Their virtue, morals, spirit and courage is exactly what this world needs to remember. For greater perspective on this matter please read The Truth of The Ancient Ways by Anatoly Anshin, it is the greatest book I have read on perspective in this matter by a man of learning, not a warrior. The are no second alternatives, one chance one life.